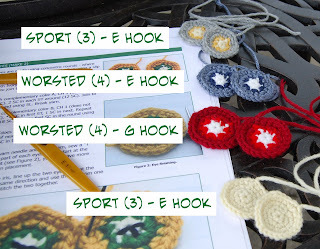 It's time to get started with lesson 1 in the Great Owl Crochet Along. In keeping with the pattern, I'm starting with the eyes. The first round is pretty straight-forward. As we discussed earlier, you can start with the chain 2 (as the pattern indicates) or a magic ring -- pick whatever you're most comfortable with -- it's up to you. It's when you get to the first color change that I want to show you a little trick to keep from having a lot of knots in your work. 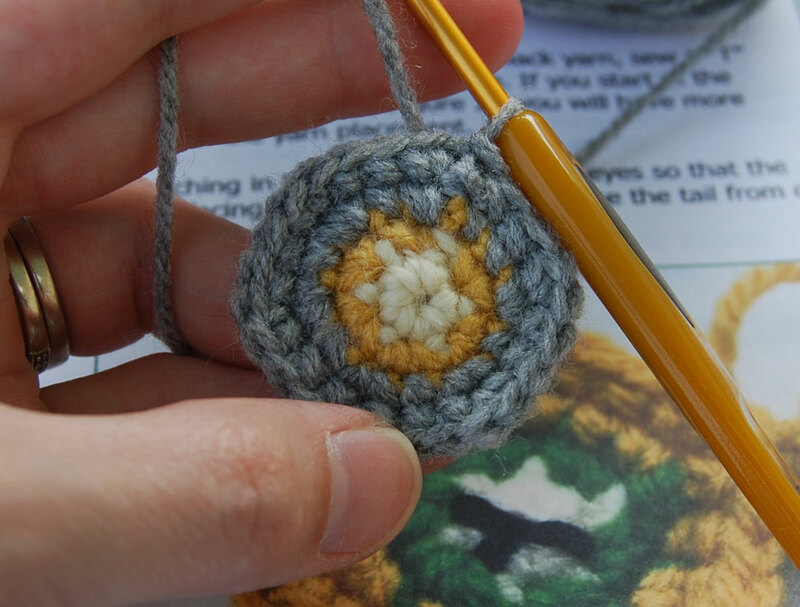 Because you're making tighter stitches, you can get away with crocheting the tails to the back of your work. Start by snipping the tail from the first round with about 1 inch (2.5 cm) to spare. Do not make a knot! Then, get your next color and make that first chain stitch for round 2 where you cut the yarn from round 1. Make sure to leave about the same amount of yarn in the tail when beginning round 2. 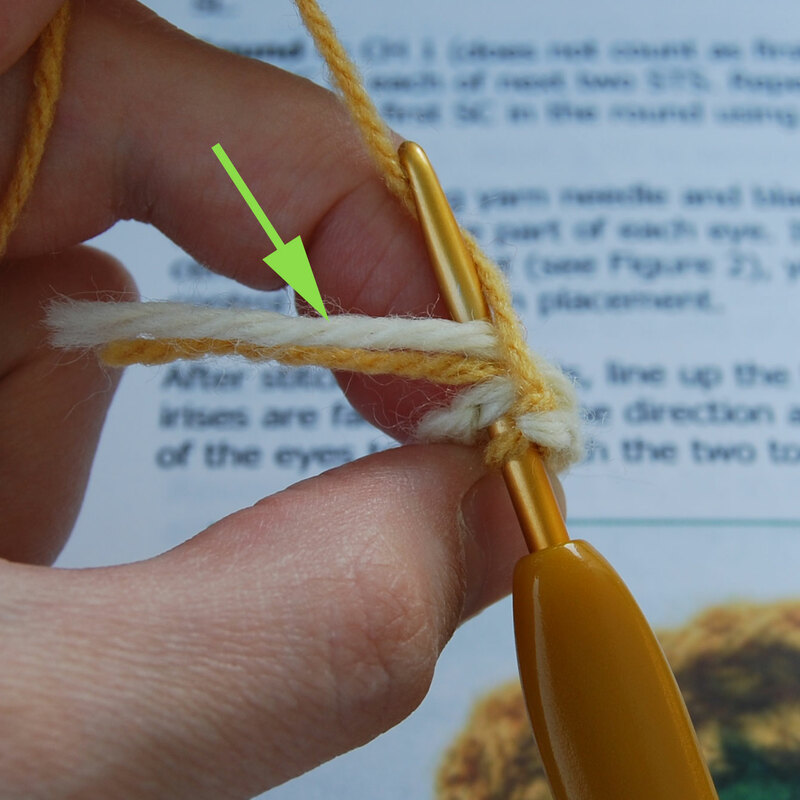 Run the two tails parallel to your work (as shown above) and with your first single crochet of round two, work across the stitch from round 1 and the two tails. Effectively, you're going to crochet the tails to the back of your work. Continue crocheting the tails to the back of your work for a few stitches (I like to do 5 or 6) and then let them drop. Continue the rest of the round normally. 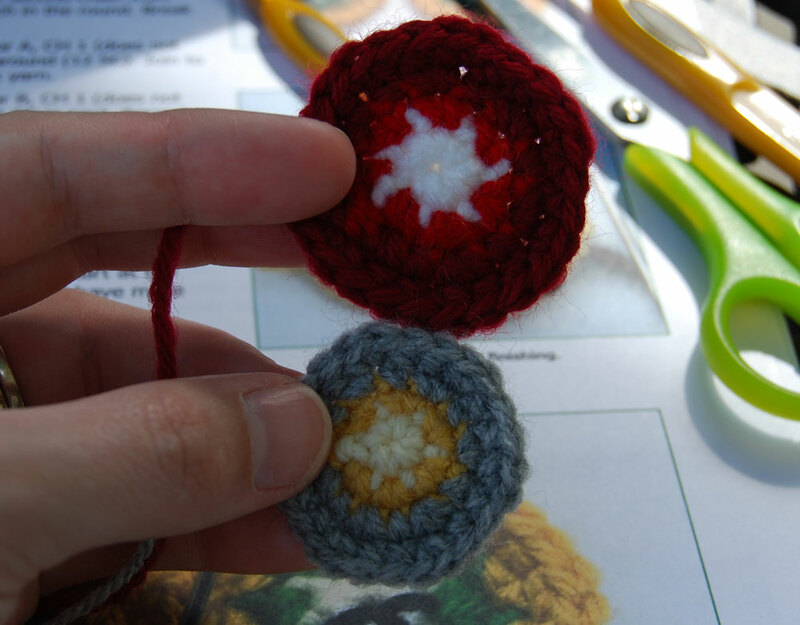 Use the same technique to add your third color and crochet the tails to the back of the work as you go and Ta-Da! You have your first owl eye! 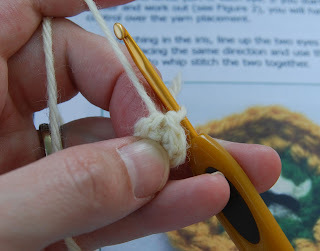 At this point, you should knot off your work and don't forget to leave yourself a tail for sewing later. 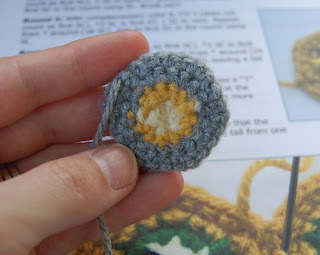 when you flip the eye over to the wrong side, you'll notice what's left of those tails that you crocheted to the back of the eye. Just snip them off and you're ready to go. For those of you who are curious, I used sport weight yarn (size 3) and an E (3.5 mm) hook to make the gray owl eyes. 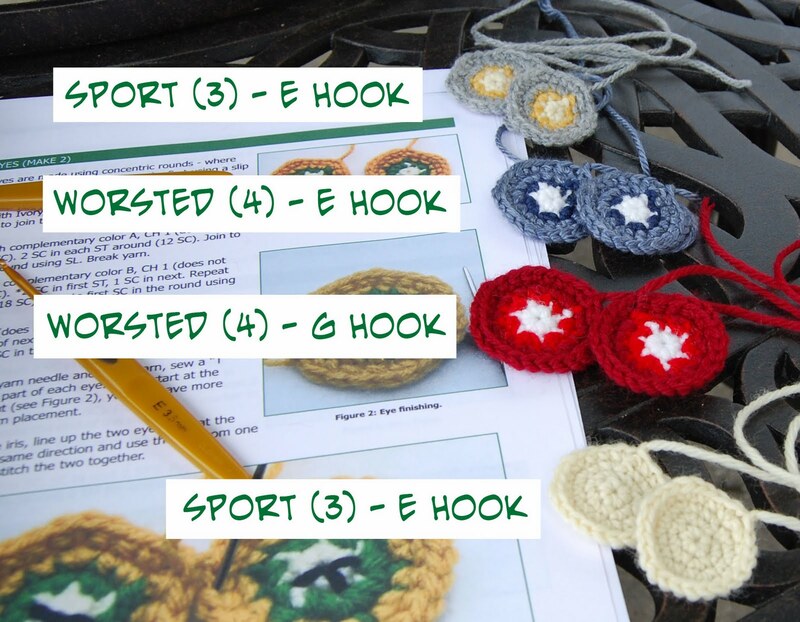 For comparison, I also made up a few eyes with different yarn gauges and hooks. The red/maroon eyes are made in worsted weight yarn (size 4) with a G (4 mm) hook. As you can see, there is quite a difference in the size of the finished piece! I also made a blue-on-blue set using worsted weight yarn (size 4) and an E (3.5 mm) hook. They're slightly smaller than the red and slightly larger than the gray. Looking back on the colors now, I'm starting to wonder if my selections were at all influenced by the Memorial Day holiday weekend. 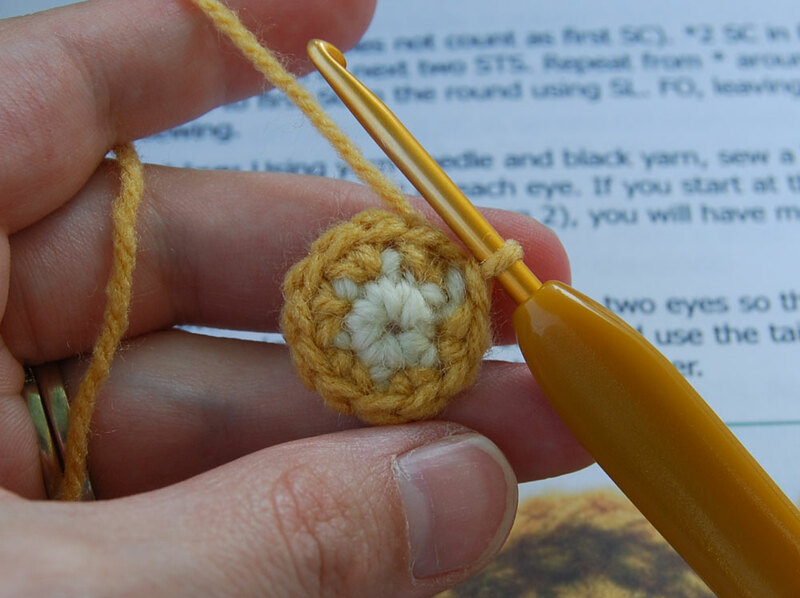 I hope all of you folks here in the U.S. enjoyed your long weekend and I hope everyone got in some relaxing time for crochet. Stay tuned for the next lesson where we'll finish the eyes -- and don't forget to have some fun with it!